Michele Marano first appears in the Painesville, Ohio, area about 1915. In America, Michele Marano was known as Michael Marano. Michele Marano, son of Salvatore Marano, was born on November 11, 1894, at Santa Maria del Molise, Italy. He married Antionetta Bertone, daughter of Giorgio Bertone and Rosa Bertone, about 1921. Michele died on December 3, 1991, at Western Reserve Health Care, Kirtland, Geauga County, Ohio, at age 97. His body was interred at Riverside Cemetery at Painesville, Lake County, Ohio. 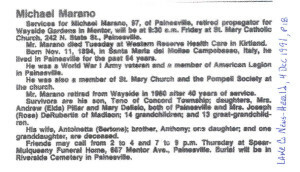 Michele Marano, age 16, immigrated to the United States on April 10, 1911, travelling to Willoughby, Lake County, Ohio, joining his brother, Felicantonio Marano. Mr. Marano was employed as a propagator for Wayside Gardens Nursery until he retired. 1. M Mary C. Marano was born on July 19, 1926, at Painesville, Lake County, Ohio. She married Alfred Delisio, son of Mariano DiLisio and Caterina Carbone. Mary died on May 4, 2008, at LakeWest Hospital, Willoughby, Lake County, Ohio, at age 81. Her body was interred at Riverside Cemetery at Painesville, Lake County, Ohio. 2. Rose M. Marano was born in October, 1927. She married Joseph DeRubertis. 3. Valentino Marano was born on January 20, 1931. 4. Elda A. Marano was born in May, 1934. She married Andrew Pillar.